Study identifies electrical control of cancer cell proliferation. The molecular switches regulating human cell growth do a great job of replacing cells that die during the course of a lifetime. However, when they misfire, life-threatening cancers can occur. A switch garnering much attention is K-Ras, a protein that in humans is encoded by the KRAS gene. The protein product of the normal KRAS gene performs an essential function in normal tissue signaling, and the mutation of a KRAS gene is an essential step in the development of many cancers. Now, a new study led by researchers at The University of Texas has revealed a new electrical mechanism that can control these switches. 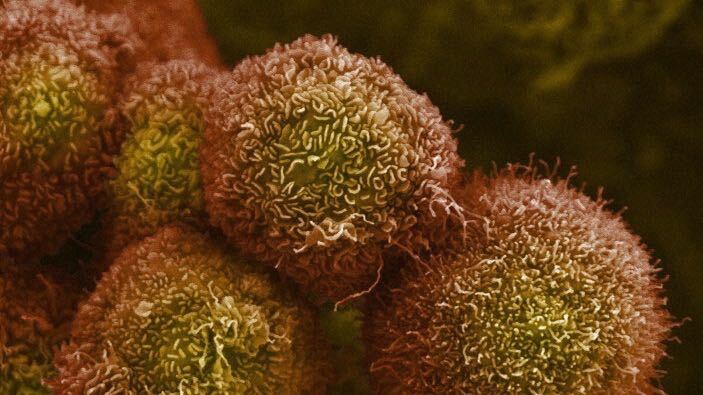 The team state that this discovery is seen as critical in developing treatments for some of the most lethal types of cancer including pancreatic, colon and lung, which are characterized by uncontrolled cell growth caused by breakdowns in cell signaling cascades. The study is published in the journal Science. Previous studies show that this proto-oncogene is a Kirsten ras oncogene. A single amino acid substitution, and in particular a single nucleotide substitution, is responsible for an activating mutation. The transforming K-Ras protein that results is implicated in various malignancies, including lung adenocarcinoma, mucinous adenoma, ductal carcinoma of the pancreas and colorectal carcinoma. Several germline KRAS mutations have been found to be associated with Noonan syndrome and cardio-facio-cutaneous syndrome. Somatic KRAS mutations are found at high rates in leukemias, colon cancer, pancreatic cancer and lung cancer. K-Ras has been shown to act as a molecular on/off switch in earlier studies. Once turned on, it recruits and activates proteins necessary for the propagation of growth factor and other receptors’ signal such as c-Raf and PI 3-kinase. K-Ras binds to GTP in the active state and possesses an intrinsic enzymatic activity which cleaves the terminal phosphate of the nucleotide converting it to GDP. Upon conversion of GTP to GDP, K-Ras is turned off. Mutated versions of the K-Ras switch are found in about 20 percent of all human cancers in the United States, this is because when the mutated K-Ras switch is locked in the on position, it drives cell division, which leads to the production of a cancer. The researchers state that they have identified a completely new molecular mechanism that further enhances the activity of K-Ras. The current study focused on the tiny electrical charges that all cells carry across their plasma membrane. Initial work was done with human and animal cells and findings were subsequently confirmed in a fruit fly model on membrane organization. With the aid of a high-powered electron microscope, the lab observed that certain lipid molecules in the plasma membrane respond to an electrical charge, which in turn amplifies the output of the Ras signaling circuit. The group explain that this is exactly like a transistor in an electronic circuit board and data findings show that the electrical potential (charge) that a cell carries is inversely proportional to the strength of a K-Ras signal. They go on to add that their results may finally account for a long-standing, unexplained observation that many cancer cells actively try to reduce their electrical charge. The team surmise that this has huge implications for biology. They go on to conclude that beyond the immediate relevance to K-Ras in cancer, it is a completely new way that cells can use electrical charge to control a multitude of signaling pathways, which may be particularly relevant to the nervous system.